These Animals is a collective based in Helsinki, consisting of (in the photo above, from left to right) Alan Bulfin, Pii Anttila, Anastasia Artemeva and Steve Maher. They have been producing a project called Gaming the System, which opens at Hakaniemi Metro Station at 17:00 on 17 September. About half of Gaming the System is being co-produced and presented by Pixelache, and we asked the team a few questions about their work. Pixelache: These Animals is a curious group - two couples, all finding themselves based in Helsinki for whatever reasons. Beyond your history and relationships/friendships, what affinities brought you together as a working group? Steve Maher: I, for one, have always respected Alan and Pii's work; a lot of this has to do with our mutual connections through Limerick School of Art and Design in Ireland. This is also where myself and Anastasia first met. The premise for Gaming the System at least feels to me as something that has developed out of our mutual interests in art as a social contract. I think we all share similar concerns about some of the ethical ramifications of art in the public realm, and what sort of impact it can have to all involved in the artwork, both its initiators and its witnesses. This over time, led to some very long conversations about games and game thinking. We looked at this through our own filter as artists/curators/organisers/human-beings, talking about play as an innate aspect of humanity. The name These Animals itself is a severely abridged and rephrased quotation from Game Theorist J. Huizinga's book Homo Ludens: "Play is older than culture, for culture, however inadequately defined, always presupposes human society, and animals have not waited for man to teach them their playing." This quote itself came from an article written for Visual Artists Ireland by one of our featured artists, Justin McKeown, called "Play is Older than Culture". Justin will be creating project R.A.T.I.S.M. for Gaming the System through his artist collective SPART. Pii Anttila: Me and Alan have been doing art projects together a few times now and always helped with each other’s projects in the past. I personally like working together with artists as a group; you can reach a much higher level in terms of social impact when working together. Also I think it was our Limerick connections, from studying in the same college back in Ireland, which has given us similar backgrounds -- continuing even with mine and Anastasia’s studies at Aalto University. We had a mutual interest towards creating a happening for the public dealing with art that uses play/game structures or strategies. We all had also as an artist an art work that deals with these things made in the past or on the process of making. Alan Bulfin: It started from chatting about creating an exibition with game structures in mind. Regardless of our research interests, what really made us work together on this project was to have art that is of the city. That is the art is as much the city itself, utilised in various creative ways depending on the individual artist. Anastasia Artemeva: I think what actually brought us together was our differences. Our research topics are similar, but our conceptual and aesthetical decisions don't always resonate, and I feel that's why this project has been so exciting for me; I felt that we could really produce something solid. With Pii and Alan it's their drive to deeply and thoroughly understand the subject and their goal to create a methodology -- a legacy in a way, rather than a temporary event -- is what made me really want to work with them. I cant speak for everyone here, but I wonder if for me the desire to organise a series of events situated in the everyday comes from the want to get to know Helsinki people, to create a place here, and to experience and test our own rules on the environment (which is only becoming somehow familiar now, after two years). In that sense public transport is perfect, as a place shared by all, and that's why it's has been so important to collaborate with HKL/Taidelinja. 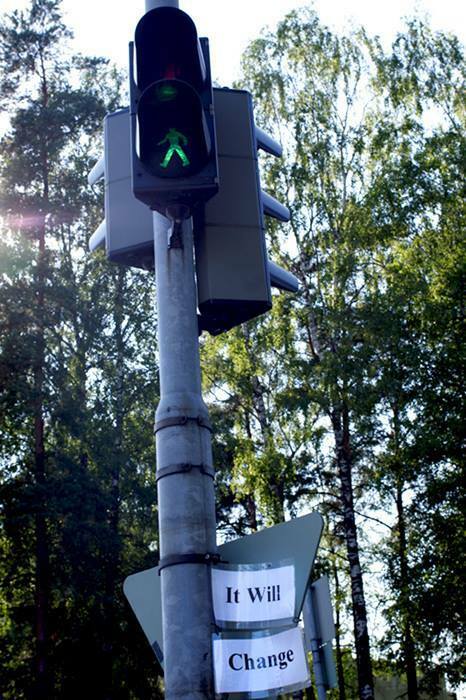 Anastasia Artemeva, International Traffic Lights Day, 2014. When the idea of 'play' is brought into art, do you think the audience should have different expectations? Are you trying to upset traditional structures or merely comment on them? Pii: I take play as a pedagogical method of learning and teaching. I see art also a strong teacher, meaning art can teach us. You can learn new ways of seeing and making concepts meaningful while experiencing art. For me, this playful attitude can create an event that games the system, and tries to give other views on how to deal with things in the public. For example, you can play against the boredom of everyday norms and habits that the living areas are full of. You can take a part of the game of giving and receiving good will, such as giving your no-longer-needed transport ticket to someone in need. What I am trying to say that art sometimes needs a field to play in. Here it is the city and its citize, attempting to share their time in the living space with each other. This creates citizens. I don't think we try to upset but rather open up people's way of seeing and reflecting on their action towards what is possible in the city and how to play with it. Steve: Well, commentary is capable of changing a structure. The intent is definitely not just to comment alone, but I think commentary, even at its most neutered and removed state, provokes something. We are definitely positioning these projects in the public realm, intending some sort of shift in thinking, but if we are honest that shift is going to be at a micro-scale. It is the small changes that probably have the biggest effect. Grand gestures never pervade, but seek to car-jack the vehicle. Subtlety, however, can be longer lasting, because it is more of an accumulative thing, a more potent meme. I think that the art works we are placing within the system of the city have the potential to pervade our understandings of those systems. Gaming the system infiltrates and the audience is not in this way a two dimensional being; they take many roles like witness, actor, player, creator. Alan: Of course we want art that has a reflexivity to traditional structures rather than just being a reflection. Personally, I would argue that art thinking is of reflexivty which can most certainly upset tradition. I think play also has an inherent reflexivty which helps to develop different understandings of complex sociopolitical structures. Anastasia: In my work I always seek to create a connection. I don't seek a long-term impact, as I feel that a connection between people is something that is fluid, changing and shifting constantly anyway. Through the artworks in GtS I would like to simply offer a possibility for two people to connect, be they fellow commuters, writing a song together using Pouyan Mohsenina's Metro Beat box, or living in different countries, like in the case of the Street Line Critics project. Games, in turn, offer a possibility to assume a new role. When we play we don't need to worry about being right or wrong, to live up to certain expectations or standards; we can be there one day and we can even swap teams. In real life, this way of thinking allows us to exist beyond the system, to make up our own rules, and to function outside of the norm. So, we neither upset nor comment; we, together with the audience, make our own structure, and this possibility is something that I want to stay with the participants as a legacy of the project. 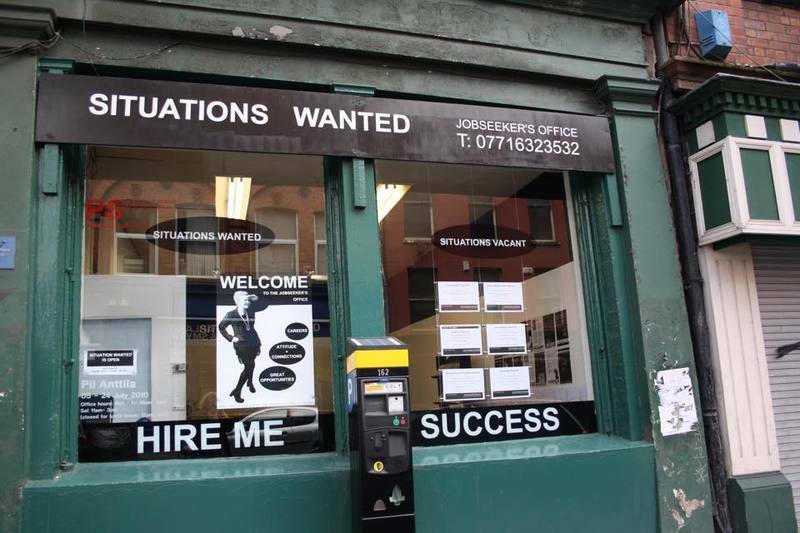 Pii Anttila, Situations Wanted. Belfast. You obviously have a very Irish-heavy programme here, which is understandable given your backgrounds and who you have worked with before. How do you think that other side of Europe deals with public art interventions compared to what Helsinki audiences might be expecting? Do you think anything may be lost in translation? Alan: For almost a decade now, many organisations have produced public art interventions similar to Gaming the System. The first time I heard about Pixelache was one such intervention by the artist group HeHe. Something is always lost in expectations - I think it is reality. More often than not expectations don't translate to reality. Anastasia: I think interventions are exciting cause you don't know how they are going to turn out. It is as much an unexpected experience for the artist as it is for the audience. I love that we can't control everything. Steve: I think the urbanism, while subject to variations across the planet, is the same beast. We reach the same conclusions when we follow the formula of urbanisation, roads, transportation, commercial zones. The buildings look different but we share a lot of the same problems when we face urbanism. Artists, to me, are more capable of seeing past regional differences for a scope of the bigger picture. So the interventions at play in Gaming the system, while site specific to Helsinki, thematically try to resolve common, global issues. Pii: I am always up for trying to bring foreign artists to Finland and collaborating with them, since I feel it is necessary to see in Finland more international artists working. It isn't easy to display your work as a foreigner in Finland with the current gallery and grant system. Especially, it is interesting to see how they observe the place and how they reflect on it. I hope this will also be for the viewers something that gives new perspective on their thinking and experience. 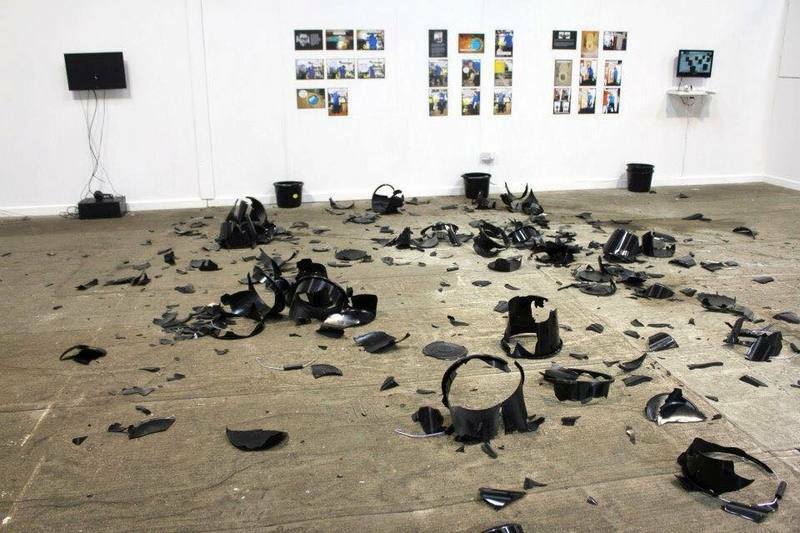 Alan Bulfin: Some Possible Infinities that May Have Been Made by Diswashers, Unrequited Hatred, The Shed Gallery, Adapt Galway, Ireland, 2012. Because Gaming the System directly tackles issues of work and sustainability, it carries with it an unavoidable political connotation. Do you feel that too heavy of a hand, in terms of the social commentary, can threaten the subjectivity of a piece? How do you regulate this balance? Steve: For me its a question of trust and respect. We can't know truly how closely our invited artists ideologies align with our own, but for the brief point in time while we all work together on Gaming the System, we have a common goal. Our own social motivations are never going to be exactly the same, as there are always different things which trigger us morally. But I think collectively, where we all are is close enough in regards to a spectrum of social concerns so we can collaborate and create some sort of lasting collective effect. It was definitely the curatorial criteria. Pii: I think this is a question of ethics in art, which often expands outside the field. When you demand art to fulfill some special task or goal it gets valued through how it succeeds on this duty. I can say I have this kind of goal in mind when I do art; I am interested in how art teaches. So I value it through this. I still want to underline that art can be successful though, even if it doesn’t reach the moral value goals given to it, since there is some kind of freedom to handle different subjects without losing artistic value. Ethics are important in everything we do, also in art. The most important thing to remember is that moral values in art can be a part of the piece but it cannot be mixed together with art's value, as the same thing. No one can predict - not the artist or anybody else - how the art work is taken and how it will get interpreted. Anastasia: I think it's impossible to separate art works from the political beliefs of the artist, which, in turn, are subjective anyway. I feel though that in Gaming the System the artworks presented also give responsibility to the audience. We have chosen the locations and delivery methods of the pieces to accommodate the audience participation as much as possible. It is not only up to the artist or curators to decide the meaning of a piece. It is an open dialogue. Or at least I believe it is. Alan: Questioning the relationship between art and politics has its one subjectivity. Just like fidelity to a lover, the balance in the relationship is always a dialogue. 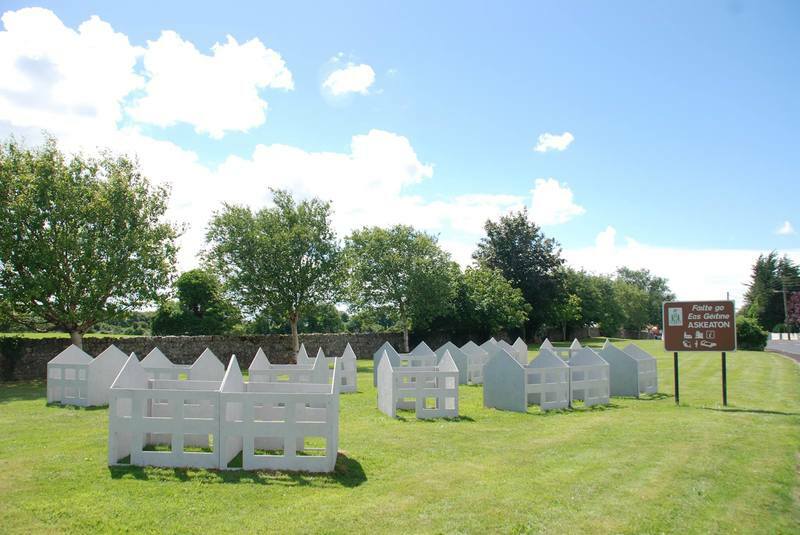 Steve Maher, Ghost Estate Model Village, Welcome to the Neighbourhood, Askeaton Contemporary Arts, 2014. What's next for These Animals, after Gaming the System? Any plans for a follow-up project, or something entirely different? Anastasia: Even though Gaming the System ends on September 27th, some of the projects will continue. For instance, Raine Vasquez launches the mobile app of Profane Displacement in November, accompanied by multimedia art installations around the city. We are also planning to produce a catalogue for GtS. Steve: We have a concept for a gallery show in the works which looks at PC computer games and moral panic, called PC Gone Mad. It is very much in development at the moment, but it looks toward micro moments in history where PC games where either scapegoated in relation to tragic events, or where games themselves asked questions regarding social morality. The show will use the actual software and corresponding hardware to create a socially activated artwork. What does 'Living Spaces' mean to you? Steve: "Living Spaces" makes me think of spaces in a fluid sense, as things which change and adapt as required by the situations which have caused them to be defined. Like, a space, as a partition of space, defined by humanity as separate to space which is this greater thing. We have to chop it up to understand it, it has to change in order for our understandings to make sense. It's living as we are living and we conceive of it. So by proxy, it lives. Anastasia: Spaces where communication happens. Pii: I see living spaces as common areas where traces of living are expressed. Alan: The demystification of human history is what living spaces means with all its complications and messiness its still just the day to day. <<< Edellinen: Tule järjestämään ohjelmaa itseorganisoituvalle festivaalille!